APSCO Plumbing & Heating's commercial plumbers make intelligent decisions quickly and provide professional, courteous, reliable and fast service. 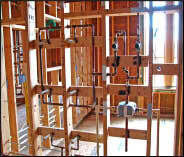 Our fully stocked trucks make it easy to complete your plumbing needs quickly and efficiently. Our company has earned an outstanding reputation by working with a variety of contractors, property management companies, and building owners. Let us help you with all of your commercial plumbing at office buildings, restaurants, and apartments and other buildings. From New Construction and Tenant Improvements, to Re-piping. Look to APSCO Plumbing & Heating for your plumbing needs.